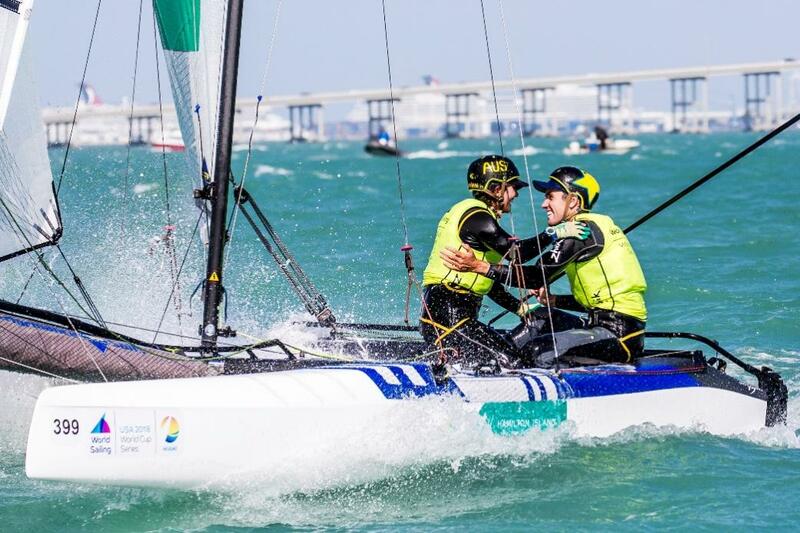 Australia sent a small but strong team to the 2018 World Cup Series Miami, USA with sailors many have seen flying over the waters of Pittwater among the team. Rio Olympics gold medallist Tom Burton headed the Laser contingent, which also features Australia’s 2017 Laser World Championship bronze medallist Matt Wearn and former Laser Radial Youth World Champion Finn Alexander. Rio silver medallists in the Nacra 17, Jason Waterhouse and Lisa Darmanin, were first to arrive in Miami to prepare and were be joined in the class by Olympic hopefuls, Tayla Rietman and Lachlan White. Their goal for this year is to get recognised in Australia as the main contenders for the 2020 Olympics. To achieve this they have to qualify and gain rankings in international regattas in order too not only advance themselves but to help Australia gain a place in the 2020 Olympics. The early arrival in Miami meant they could 'test the waters' locally. “It was really helpful for us to learn about the weather conditions and get back into the swing of racing,” they said via email. “We’ve had mixed wind strengths from all different directions over the last 12 days. We’re feeling confident that we’ve used our time here well and are ready to take on whatever conditions Miami presents this coming week. Tash and Annie were the 2016 Youth World Champions in the 29er but elected to move into the 49er instead of defend their title. The transition has been challenging but they believe they are on the right trajectory. “Since changing from the 29er the standard of the fleet is much higher,” they said. “The top teams have set the bar high but we’re ready to put in the hard yards to reach their standard and beyond. 27 Olympic medallists as well as World and Continental Champions registered to compete in Miami, including five medallists from Rio 2016. 543 sailors from 50 nations raced in Biscayne Bay. As the only North American regatta to be included in the World Cup Series, the regatta is a mainstay on the winter circuit for sailors campaigning for the next Olympic Games. Competitors in the 49er, 49er FX, RS:X, and Nacra were to have five days of fleet racing from Tuesday, January 23 to Friday, January 26 with medal races on Saturday, January 27- and Sunday 28th - 28th and 29th Australian time. The 2018 World Cup Series Miami was the 29th running of the event. Regatta Headquarters were located at the City of Miami’s Regatta Park, in Coconut Grove, Miami, Fla. Additional hosts for the event included the US Sailing Center Miami (a U.S. Olympic Training Site) and Coconut Grove Sailing Club. These sailing organizations host classes onshore, as well as help run the on-the-water racing. The Coral Reef Yacht Club hosted the Opening and Closing Ceremonies. Round one of Sailing's 2018 World Cup Series was held at Kaiyoh Yacht Harbor, Gamagori, Japan in October 2017. The third leg of Sailing's 2018 World Cup Series will be held in Hyères, France, this April 22-29, and the Final at Marseille, France, June 3-10, 2018. "Rio 2016 silver medalists Jason Waterhouse and Lisa Darmanin (AUS) have done their homework when it comes to the lifting foils that were introduced to the class less than a year ago. Whether in near-drifting conditions on the opening two days or the full-on breeze on the third, they have been extremely hard to beat, winning five races and posting just one finish outside the top four." World Sailing reported. On day four winds averaging nearly 30 miles per hour, with gusts close to 40, ripped across the bay and all sailing was cancelled. "We had some hope because yesterday the forecast indicated that the wind strength would drop at midday but it didn't," said Antonio Gonzalez de la Madrid (ESP), World Sailing's Technical Delegate for the regatta. "Instead it increased and the average was above 25 knots. In the afternoon the average wind strength was 27 to 28 knots and gusting up to 35 knots. "World Sailing's Race Management policies prioritise fairness and safety when conducting races. The policies recommend not starting a race when the wind is above 25 knots and this is reduced to 22 knots for the 49er, 49erFX and Nacra 17 when the sea state is rough. "It was not safe to go sailing today and it would have resulted in a lot of broken equipment and it's not good for the sailors to have this problem before the Medal Races." For five of the fleets competing this week-the Nacra 17, 49er, 49erFX and Men's and Women's RS:X-today marked the end of the full-fleet portion of the regatta. The top 10 in the overall standings going into the day will advance to tomorrow's double-points Medal Race, which will decide the overall podium positions. Tash and Annie did their best in challenging conditions but with with day four cancelled they missed the medal race by a small 3 points. "Racing in this fleet of experienced sailors has taught us many things, highlighted some weaknesses that we will go home now and work on but it has also shown us that we do have some major strengths in a variety of conditions! We cannot wait now to get home and get back to training after a big few months away racing! "We’ll tick off as many things as we can before our next trip to Europe in the end of March! "Thank you to our supporters, family and friends, sponsors and coach for all the guidance and help you’ve given us along the way so far! We hope everyone’s had a great start to 2018, can’t wait to see what the rest of this year brings!!!" they posted on their Bryant Wilmot Sailing page on Monday (January 29th, 2018). Lisa Darmanin and skipper Jason Waterhouse (AUS) started the Medal race with a 19-point lead, which meant they only needed to finish the race to ensure the gold medal. Instead they added one more victory to their scorecard, showing exceptional control in challenging conditions. 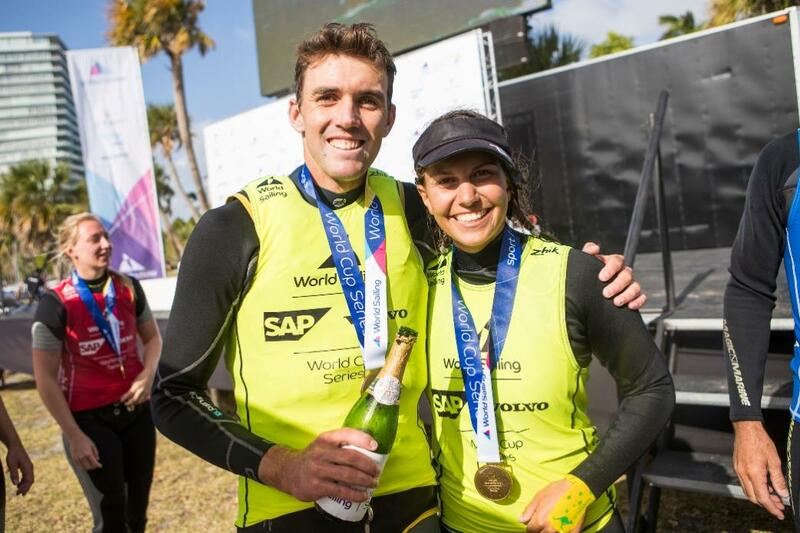 The win meant Olympic silver medallists Jason Waterhouse and Lisa Darmanin have set the foundation for a big 2018 after capturing gold in the Nacra 17 class at the World Cup Series in Miami. The cousins held their nerve against the world elite, asserting dominance over Rio gold medallists Argentina’s Santiago Lange and Cecilia Carranza Saroli to win the series by a sizeable 23 points. Laser sailor Tom Burton had the gold medal locked up courtesy of a 30-point advantage, and decided to use the Medal Race, Monday January 29th Australian time, to work on his starts. All evidence to the contrary-including two race wins and eighth top-seven finishes in this event-Burton wasn't quite satisfied with his ability to get off the line. He'll need a little more work as he pulled the trigger just a hair early and was recalled OCS by the race committee. Without anything to gain or lose, Burton was content to follow the fleet around the track, finishing ninth and still winning the class by 17 points. Burton’s sparring partner in the Laser, Matt Wearn, recovered from a slow start to the regatta to roar into fifth place – including winning the medal race - in the powerful 70-boat fleet. “It’s been a tough week and I’m stoked to win here in Miami - especially before the medal race,” Burton said. A good start for 2018 for all these Australian sailors and a great example of how good the programs and support is through local Pittwater Sailing Clubs.